Eric is a drummer and multi percussionist. Amongst the instruments he plays are congas, timbales, cajon, Pandeiro, Talking Drum, Shekere, Tambora, Bongos, Udu, Djembe, Some Tabla and electronics. Eric is experienced in many styles. From African Afro Cuban or Brazilian Rhythms to modern dance and funk/soul sounds. He definitely knows how to get people dancing! 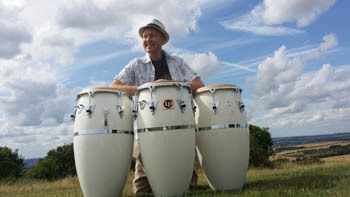 He has a large list of various recordings on drums and percussion. 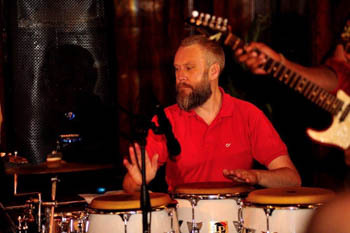 Eric has worked with Jocelyn Brown, Oliver Cheathan, Lance Ellington (strictly), King Salsa @ (ronnie Scotts), Manhattan Afro Cuban big band (Nuyorican poets Newark), Vivasantana (Wembley Conference Centre, Piano interrupted (Berlin). Eric has done a lot of broadcasting work playing on radio and television such as for Swift cover insurance add staring Iggy Pop, LV insurance TV add, Smirnoff add, BBC Asian Network Add & more.